The rain has begun. Drops fall fat on steaming forearms. Tires on the pavement sounding like lost AM radio signals. Dial it in. Face drawn, eyes up, flip the brim of your cap down. The connection is made. Bikes are time machines. Moving not like the reenactment of some Civil War battle, but like Marty McFly through the past. They are direct conduits to times past, hardships endured, battles fought, won and lost. A rider, subconsciously or not, moves with the same motions and facial expressions of the rider 100 years ago. Sits in the same position, fears the same hills. The hunger is deep at the end of a ride, the legs have the same feeling of day old room temp jello. And the cycling cap is there, perched Belgian style, high atop the head, or pulled down low against the rain, or backward on a steep decent, or rakishly canted, a ship tossing on a storm writhed sea. The colors and the pattern and even the origin of the hat are cues: teams supported, races ridden, swaps attended. We learn the origin story through visual cues. Is the hat dirty? The brim sweat stained? Holes burned in it from campfire sparks? Is it crushed? Threadbare? Perfect and crisp? Not this authors. The hat must come from a place to go to a place. In other words, the cap must be procured for a reason, so that it may exist with reason. Sometimes you are what you own. 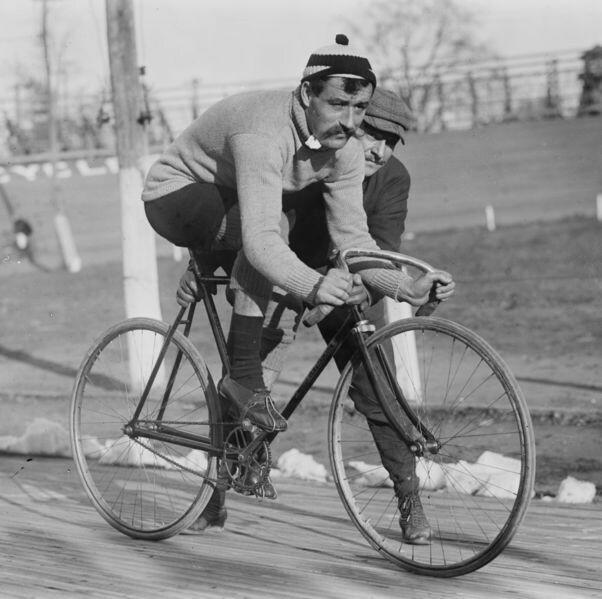 The cycling cap has humble origins. Original cycling caps where just appropriated from other walks of life. Baker’s brimless skull caps, the chicken and egg problem of the Welder’s cap, knit alpine beanies for mountain stages. The first caps were just whatever would get the job done. There is validity still in the found cap concept: it’s hot, out, you need to get the sun off your face, almost anything will do, even a Redsox hat. But the quiet grace of the cap, its packable construction, its minimalist fit, the telegraphed poise, these attributes elevate the cap to the level of gestalt. Nothing can be added. Nothing removed. The casquette is in trouble. How does perfect design fall onto hard times? Progress means forward movement towards a greater goal. In the case of professional cycling, this greater goal is the ability to plaster more sponsor names on any given garment. So the small, quiet grace of the cycling cap is being supplanted by the gaudy Nascar-esque fitted baseball cap. The podium is now mounted three men who look like rejects from the Class A Short Season Minor Leagues. The compulsory helmet laws of the past decade in pro racing have also helped with the demise of the ubiquitous cycling cap. The racers’ abandonment of the caps has caused a vacuum in the universe. The universe, abhorring vacuums, (and house hold cleaning in general) gave us the hipster, who has appropriated the cycling cap. The hipster, his world clouded by pastiche, wears the cap as a statement of fixed gear solidarity. Perhaps they don’t actually own a fixed gear, or, owning one, know how to properly ride one. Having just bought a Dokken album, Larry remembers his record player is still in his mom’s basement. Then he realizes: that’s perfect, I live in my mom’s basement. It is time for real cyclists to reclaim the cap. Pull it low, hide the suffering, and destroy the mountain. Dip it in a silty drainage ditch and let the muddy water cool your broiling head. If you race, take the podium in a cap, not a hat. If you race in the rain, wear it under your helmet. If you go out to eat, wear something decidedly unhip, and a cycling cap, to undermine those who wear it with senseless irony. We’re about to embark on a huge summer o’ shop rides. Join us for a few, maybe you will get hooked. Sunday evenings: If it isn’t raining horribly, meet at the shop at 5pm. We’ll hit the road around 5.30 for a 30-45 mile road ride at a decidedly casual pace. We occasionally hit dirt roads, but it’s a road ride so you can bring a road bike, we promise. The terrain will be hilly to downright mountainous, but done at a pace that won’t leave you gasping for air. We even take breaks. Bring these things with you: Lights (front and rear), spare tube (at least one), pump/co2, some food, some money for soda or whatever along the way. Wednesdays: Hill ride with Brian. Meet at the shop around 5, wheels down at 5.30 in the evening. Fast (but not insane fast) road ride up into the mountains, back down again, back up again, and down again. Back before dark but bring a rear blinkie in case of mechanicals. Thursdays: Mountain ride with Brian and Team Flying Dog. Meet at 5.30 at the foot of the dirt section of Mountaindale Road, by that big maintenance shed. Hilly, technical watershed mountain biking, but a relaxed pace. Back before dark. Sunday Mornings: (starting June 10th) Women’s beginner road rides from the Starbucks in the Westview Shopping center. 10am (I think, check Facebook for details) 12-18 miles on low traffic roads. Rides will be led by Tracy, who works here, and know the roads well, and all that good stuff. She’ll have more details in next week’s post, so stay tuned for that. Have the older boys been making fun of your cap again?